Michael Wolk is a cardiovascular specialist practicing in the HeartHealth Program of the Dalio Institute of Cardiovascular Imaging at New York Presbyterian/Weill Cornell, a Professor of Clinical Medicine at Weill Cornell Medicine and an Attending Physician at New York Presbyterian Hospital and Hospital for Special Surgery. He currently is the Senior Health Policy Advisor to the 1500-member physician organization. Dr. Wolk also serves on the Dean’s Council Executive Committee. 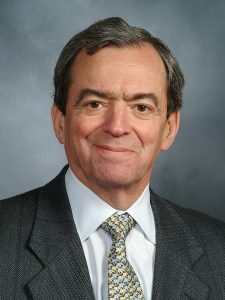 He is a former President and current Trustee Emeritus of the American College of Cardiology, and currently serves as Chair of the Cardiovascular Practice Section. Dr. Wolk received his Bachelor’s Degree at Colgate University, and MD from Columbia University College of Physicians and Surgeons.